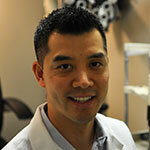 Dr. Kevin Tong graduated from the State University of New York, State College of Optometry in 1999. He practiced in hospitals and pediatric clinics in the United States before returning to the Toronto area. He worked collaboratively with ophthalmologist, Dr. Leslie Landecker, in cataract surgery, and glaucoma treatment, before joining Drs. Parsons, Tong and Gupta in the Fairview Mall. Dr. Tong is passionate about giving the best eye care to his patients. He takes the time to understand their needs and attend to their eye health questions. He takes pride in seeing their satisfaction with his service and is proud of the many referrals from returning patients year after year. In his spare time, Dr. Tong is actively involved in the community. He organized health fairs to promote awareness of eye diseases and volunteered his service to underprivileged children. He also enjoys teaching and has been a mentor to many students requesting his guidance.